There are many golf balls to select from, but a small number regularly make it on “the best” lists that are published by various golfing magazines and independent reviewers. Most of these balls are used by tour professionals, and they have all had extensive testing and evaluation. These balls are quality balls for low handicap players. The best ball for you is the one that suits your game and is matched to your swing speed. 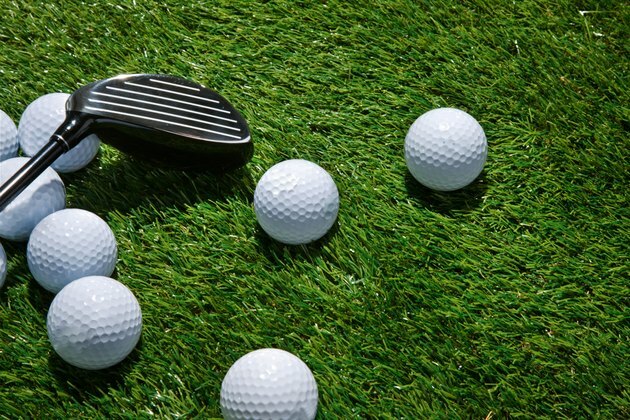 These two balls are the number-one choice of more professional golfers than any other balls and both have been given top ratings by "Golf Digest." Both have a soft feel, excellent spin control and hold the greens well. They are both multilayer urethane-covered balls. The Pro V1 has 352 dimples with five different dimple types to give it a penetrating flight. The Pro V1x, on the other hand, has an extra core and is designed for a higher launch, with seven different dimple design types and 328 dimples. The Pro V1x also has more spin on the greens and with the shorter irons. TaylorMade launched its first tour golf ball in 2010, and its 2014 press release for TaylorMade Tour Preferred balls mentioned that TaylorMade is the number-two golf ball brand on the PGA Tour. The company has been very innovative with their design and use of materials. The ball has a cover that is thinner, softer and more durable than its predecessors. The 322 dimple pattern is designed to maximize distance of low-spin shots. The X model gives players more spin on iron shots than the standard Tour Preferred model. The Speed Regime, SR, golf balls are the first range of golf ball that Callaway has produced that is based on swing speed. There are SR1, SR2 and SR3 balls; SR3 is for players with swing speeds of 105 mph and over, and the balls are aerodynamically optimized for that swing speed. The HEX Black Tour is one of the longest, low-spinning tour balls available. Both Callaway balls have the trademark hexagonal pattern. This ball has a 344 speed dimple design and a “spin skin” coating which improves friction between the club face and the ball by 20 per cent from their previous model, to give more spin and control on the greens. The enhanced dual core gets softer from the outside in. It is available in white and yellow and gives excellent distance plus good control around the greens. These balls are very durable, have a muted sound off the tee and give straight flight, even in crosswinds, with reduced side spin off the driver. The XV version has less driver spin than the Z-Star. The B330 is a four-piece construction ball with 330 dimples. It has a soft urethane cover for control on the greens and is designed for players with swing speeds over 105 mph. The B330-RX is suited for swing speeds under 105 mph. Both balls have a regular version for longer distance and an S version for more spin and control on the greens. The RZN golf balls have an interlocking core design comprised of resin that is molded into a pattern that looks like a waffle iron. This allows the outer layers of the ball to grip the core well, minimizing the amount of air in the ball and maximizing the energy at impact. Both balls are designed for players with swing speed over 105 mph, with the RZN Platinum emphasizing control and moderate spin and the RZN Black focused on distance and less spin.